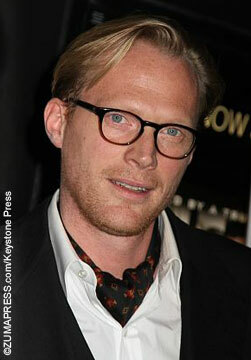 Paul Bettany, who was the voice of Tony Stark’s computer system, J.A.R.V.I.S., in the Iron Man movies and The Avengers, has signed on to play the Vision in Marvel’s The Avengers: Age of Ultron. The Vision is a synthozoid with a human heart who appears in the comic books. Programmed with the brain patterns of Wonder Man and created by robotic archenemy Ultron, the Vision joins The Avengers and fights with them against the bad guys. His powers include superhuman strength, endurance, and a jewel on his forehead that projects blasts of solar energy to destroy enemies. He can also become as hard as a diamond or as light as a ghost. Best of all, he can materialize within another person’s body, causing them extreme pain. He’ll join returning cast members such as Robert Downey Jr. as Iron Man, Chris Hemsworth as Thor, Scarlett Johansson as Black Widow and Chris Evans as Captain America. Age of Ultron is the second of the Avengers movies and opens May 1, 2015. Hope they do it right! I hope they have a scene where Vision talks to Jarvis. While investigating a luxury villa the couple had bought in Canada with embezzled money, prosecutors found they had forwarded the money through an illegal foreign exchange dealer, and this led to the discovery of the illegal foreign exchange trading scheme. A retired colonel in China’s armed police force, Zhang Guowei, who is gay, was delighted to find an extra-thick copy of Friend Exchange had arrived one morning. In the northeastern city of Shenyang, authorities last week detained 12 people and seized 40 tons of bean sprouts tainted with banned food additives, including sodium nitrite which can be toxic for humans in large amounts and is carcinogenic. Farmers used the additives to make the sprouts grow faster and look shinier. 91st Academy Awards – download your score sheet! Which Game of Thrones character is the most changed?